METAPHYSICAL PROPERTIES: When wearing CARNELIAN, one becomes the center of attention as this stone make you Attractiveness. 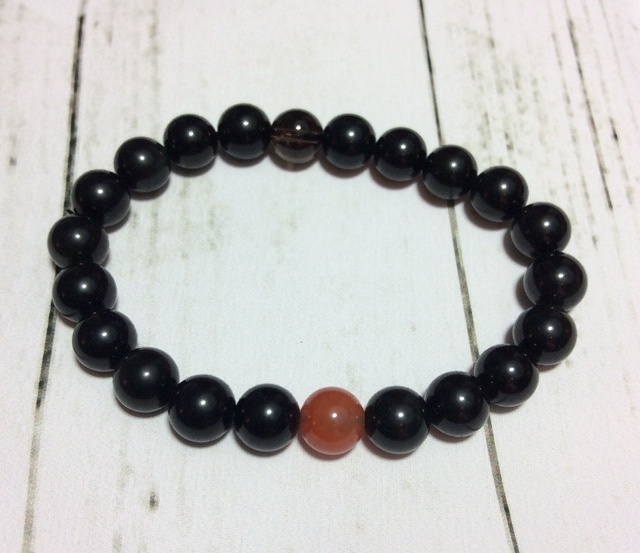 This Energizing Gem balances your Sacral Chakra, Boosts Creativity, Enhanced Vitality and Awakens Passion. I am totally in love with this bracelet, I'm very happy with it. It arrived beautifully packaged, it really is very well presented. I would be over the moon if I received this as a gift from a friend or family member. 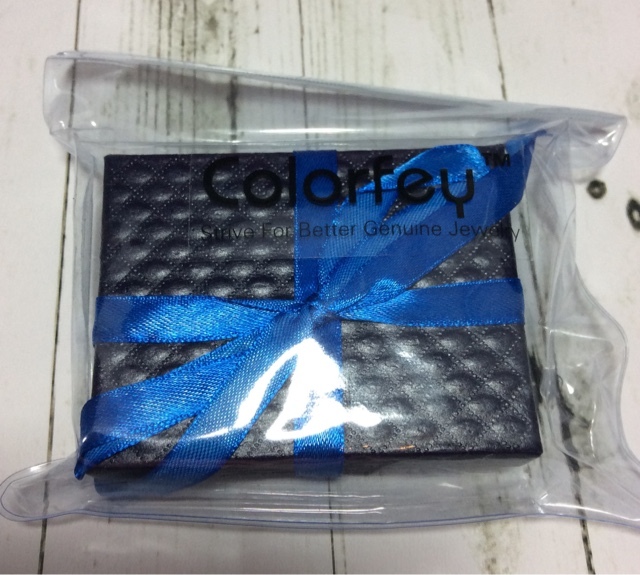 The bracelet is in a gorgeous gift box and wrapped in blue ribbon. It is then sealed in a branded plastic bag. The box is of very high quality and has a quilted, embossed style effect, it's much nicer than boxes you'd usually get with jewellery in this price range. 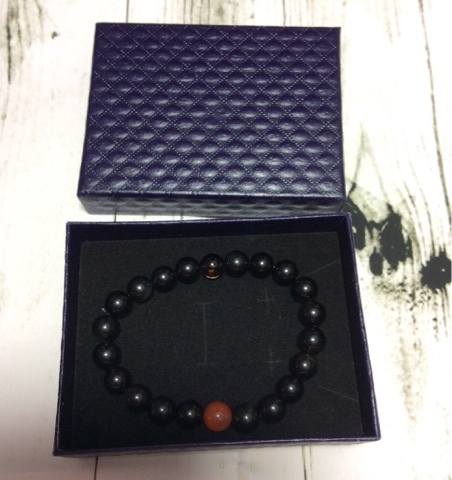 The bracelet has several Black Obsidian Mala beads, one Smoky Quartz bead and one Carnelian bead. 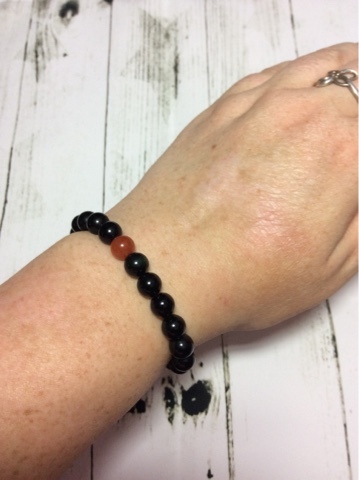 These beads are said to have healing properties, but personally I chose the bracelet because I really like the look of the beads, not for it's health benefits. 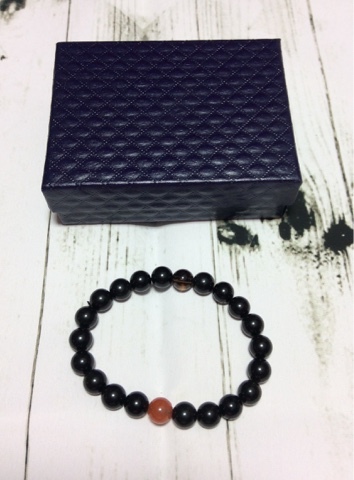 I love this bracelet, it looks lovely on my wrist. It's very comfortable to wear as the beads are so smooth, they don't rub or irritate my skin. Size wise I could have done with it being one bead larger, as there was a slight gap where a couple of the beads didn't touch when it was on my wrist. I have medium/large wrists. It was still comfortable though and it didn't feel at all tight. I'm very impressed with the quality of this bracelet. The beads are exquisite, they look much better in real life than in photos. The elastic feels very strong and is in no danger of breaking any time soon. If you're looking for a gift I'd highly recommend this bracelet, the recipient is sure to love it. I've given this bracelet five stars.